Notice that all the prophesied doom and gloom comes first and the watered down good news is not mentioned until the very last sentence, which could hardly be more innocuous. Point 1 – No mention of first author Karyn Rode. Why not mention the paper’s first author? That’s not just rude, it’s unprofessional. I can’t imagine her being happy about it but what can she do? Her employer and senior male colleagues would rather her important research remain as much out of the limelight as possible. While it may make it more difficult for people to find the paper if they don’t have the first author’s name, but I doubt that’s the only reason. Point 2 – Don’t actually promote it. Regehr’s statement was simply posted on the Alaska region website of the Fish & Wildlife Service. The first paragraph, quoted above, appears as one item on a rotating page of “news” (here) that will eventually move to the bottom and disappear from view (pdf here). In other words, it doesn’t have a separate page with its own unique address. The item was not posted on the FWS Alaska Facebook page or the USGS Alaska Science Center website or its Facebook page (as of Sept 6). This treatment virtually guaranteed that the media wouldn’t hear about it – and neither would the general public. How far did the good news spread? As of September 6, I found only two stories online based on Regehr’s FWS statement (SitNews simply reprinted it). Greenpeace-activist-turned-activist-science-writer Kieran Mulvaney was the first to pick up the FWS statement (via a tweet by Geoff York on Aug 28th). He basically reiterates Regehr’s FWS statement but he does at least mention Karyn Rode’s contribution (Discovery News, Aug. 31, 2013, “For polar bears, some places better than others”). Polar Bears International picked up the story (September 2), with the eye-catching title “Chukchi Sea polar bears.” It starts out with the same muted version of the good news as the FWS statement and extensively quotes polar bear biologist Steve Amstrup, their chief scientist and primary spokesperson, who emphasizes the FWS “we expected this to happen” (debunked in Point 4 below) and the “focus on the prophesied future” memes (Point 5). Update September 11 2013: Alaska Dispatch (A. Feidt, Sept.10) has a story [h/t commenter nvw] that includes an interview with Eric Regehr (“Chukchi polar bear population remains healthy as ice coverage lessens”). 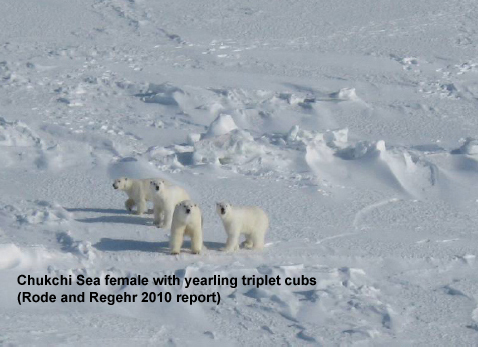 “Our spring 2008-2011 observations of CS polar bears in good condition and with high recruitment [litter production] are consistent with autumn observations of bears from this population on Wrangel Island during the same period (Ovsyanikov and Menyushina, 2010). …the majority of the CS population dens on Wrangel Island or nearby smaller Herald Island. In fact, the body condition and litter sizes of Chukchi polar bears (more details here and here), which are the primary indicators of population “success” – were not only unchanged or improved after 20 years but better than virtually all other populations that have been studied, including Southern Beaufort, Western Hudson Bay, Davis Strait, Baffin Bay, Gulf of Boothia/M’Clintock Channel, Lancaster Sound and Svalbard (see Fig. 1 below). So, the good news is phenomenally better than the statement lets on. Figure 1. 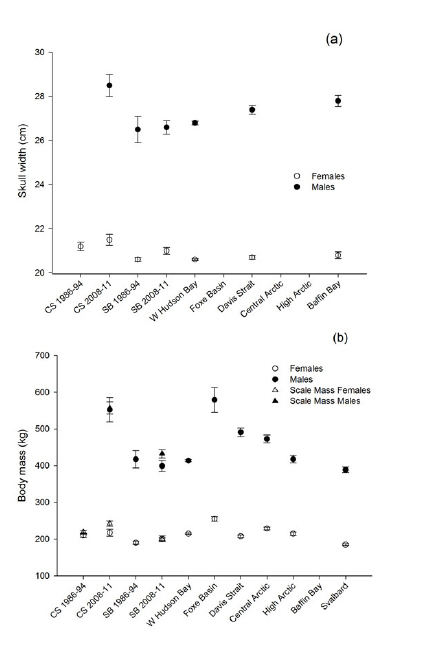 Skull width, which measures amount of stored fat (a) and weight (b) of Chukchi male and female polar bears compared to other populations measured. CS, Chukchi Sea; SB, Southern Beaufort; Central Arctic = parts of Gulf of Boothia and M’Clintock Channel; High Arctic = Lancaster Sound. Point 4 – We expected this to happen. This is entirely not true. “The findings are exactly in line with our predictions,” says Dr. Steven C. Amstrup, our chief scientist, who led polar bear research in Alaska until 2010. “The near-term effects of global warming on sea ice and polar bears are expected to differ geographically…. In other words, they knew all along this would happen. Really? Actually, the shortest-term prediction that has been made is 25 years in the future, as explained in the Amstrup et al. (2008) paper cited by Rode et al. 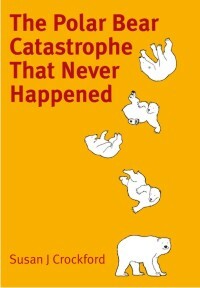 : there have been no “short-term” predictions, only assertions that some polar bear populations are currently suffering. The variation they “expected” was between defined ice ecoregions, not within them (see Fig. 2 below), 25-95 years from now. For example, if warming continued into the mid-21st century, they proposed, bears in the Central Canadian Archipelago, the Arctic Basin and East Greenland (“Archipelago” and “Convergent” ice regions, gold and blue on the map) would likely do better because thick, multiyear ice would be replaced by first year ice. Populations in those regions might increase as a consequence, even though populations to the south (in “Divergent” and “Seasonal Ice” regions, purple and green on the map) would decline or be extirpated (Amstrup 2011; Amstrup et al. 2008, 2010; Obbard et al. 2010). 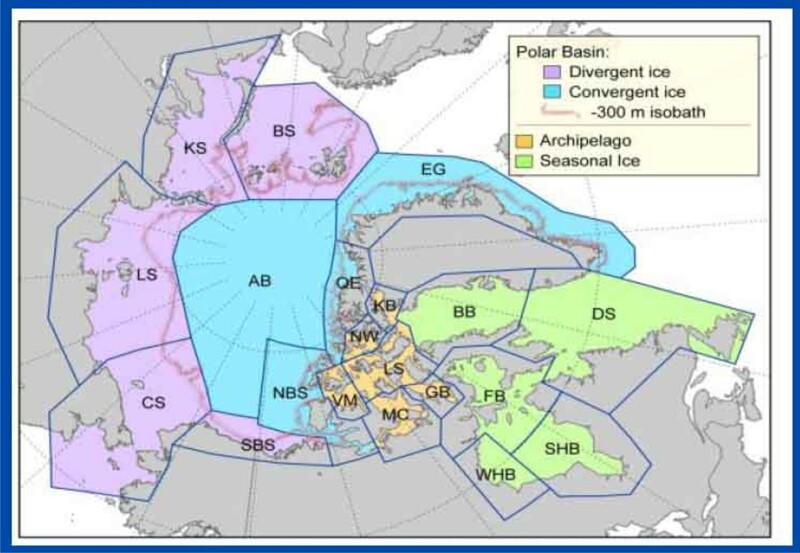 They did not expect that bears currently living near the southern limits of their range, in so-called Divergent and Seasonal Ice ecoregions (including Chukchi Sea and Davis Strait, see Fig.2 below), would do well – or better – despite large declines in summer sea ice. In other words, the prediction schemes used to get polar bears listed as threatened under the US Endangered Species Act treat the Chukchi and Beaufort Seas as identical habitats that would be among the worst affected. Now they claim these region are significantly different. Point 5 – Focus on the future. 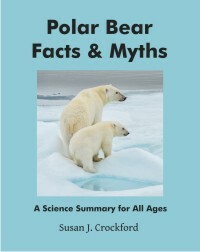 Regehr and Amstrup insist that the results of the Chukchi study should not be seen as an indication that all or most polar bear populations can do well despite sea ice declines in summer [even though Regher’s statement acknowledges (see Point 3) that it is the amount of food in the spring that made the difference for Chukchi bears]. For years, they’ve been telling us that polar bears are already being harmed and that this foreshadows what could happen in the future. If things are so good now, despite declines in summer sea ice, what does that say about the accuracy of their predictions? In reality, the Rode et al. Chukchi paper is strong evidence that their predictions of a grim future for polar bears – based on theoretical responses to summer sea ice declines that, we are told, are already in play – have been refuted by their own studies. It’s no wonder they want to keep the media away from this story. Obbard, M.E., Theimann, G.W., Peacock, E. and DeBryn, T.D. (eds.) 2010. Polar Bears: Proceedings of the 15th meeting of the Polar Bear Specialist Group IUCN/SSC, 29 June-3 July, 2009, Copenhagen, Denmark. Gland, Switzerland and Cambridge UK, IUCN. Rode, K.D., Douglas, D., Durner, G., Derocher, A.E., Thiemann, G.W., and Budge, S. 2013. Variation in the response of an Arctic top predator experiencing habitat loss: feeding and reproductive ecology of two polar bear populations. Oral presentation by Karyn Rode, 28th Lowell Wakefield Fisheries Symposium, March 26-29. Anchorage, AK. Abstract below, pdf here. 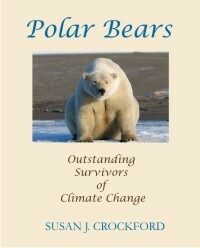 This entry was posted in Advocacy, Conservation Status, Life History, Sea ice habitat and tagged advocacy, Beaufort Sea, body condition, Chukchi Sea, Davis Strait, Divergent ecoregion, ecoregions, endangered species, Eric Regehr, FWS, good news, Karen Rode, Kieran Mulvaney, litter size, media manipulation, PBI, Polar Bear Specialist Group, polar bears, Polar Bears International, predicting, sea ice loss, Steve Amstrup, summer ice minimum, summer sea ice, suppression, the "message", US Fish and Wildlife Service, us geological survey, USGS, WWF. Bookmark the permalink.